INSTANT DOWNLOAD digital file (ONLY)! No physical items will be shipped, and NO REFUND provided. ∞ Print as many as you want! - 8.5" high, 300 dpi (for professional printing).File Format: PNG (ONLY). - 5" high.File Format: PNG (ONLY). - 2" high.File Format: PNG (ONLY). 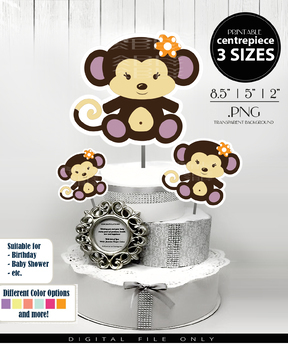 - paper glue or double-sided tape (to make backside or to stick the centerpiece to the cake). Once payment is complete, digital files will be available for download in your account and an email will be sent to your Etsy registered email. Downloaded products are non-refundable.